More Information on Mariazell’s history! Mariazell is one of the centers of winter sports and holiday resorts, with lot of entertainment opportunities and it is full of hotels, restaurants and cafés. The settlement has many various well-maintained slopes, which are different difficulties so they are ideal for the whole family’s winter sports demands. During the whole winter season, snow is provided due to snow cannons. The ski resort has many entertainment facilities, such as: swimming pool, sauna, fitness room, ice-skating and toboggan run, horse surfing and ice fishing. Marvelous family ski resort while it has many modern lifts and elevators. It is the perfect place in the summer for hikers, with breathtaking view for the neighboring mountains. 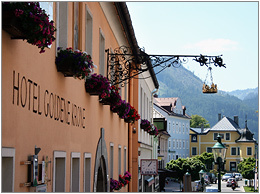 The Hotel Goldene Krone is a perfect place for a summer vacation, a fabulous weekend or the wintertime skiing. 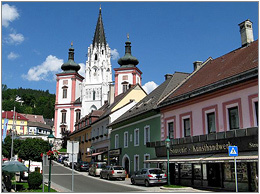 The hotel is situated in the main square of Mariazell, in front of the famous Basilica. The hotel has 22 rooms, and our staff speaks German, Hungarian, English, Romanian and Italian. Our Hotel may undertake weddings, various school celebrations while our restaurant is available up to 120 people. 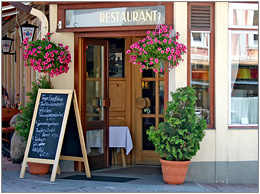 Take a look at our restaurant’s homepage!